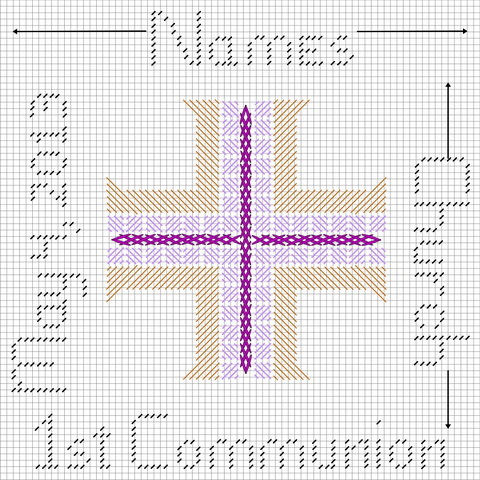 I have done three 1st Communion Crosses, each is a bit different, but I still planned them all out on graph paper before stitching. 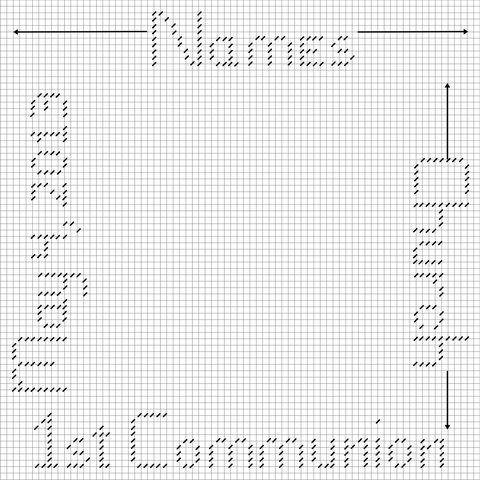 I plan out on graph paper the name and design before I begin stitching. 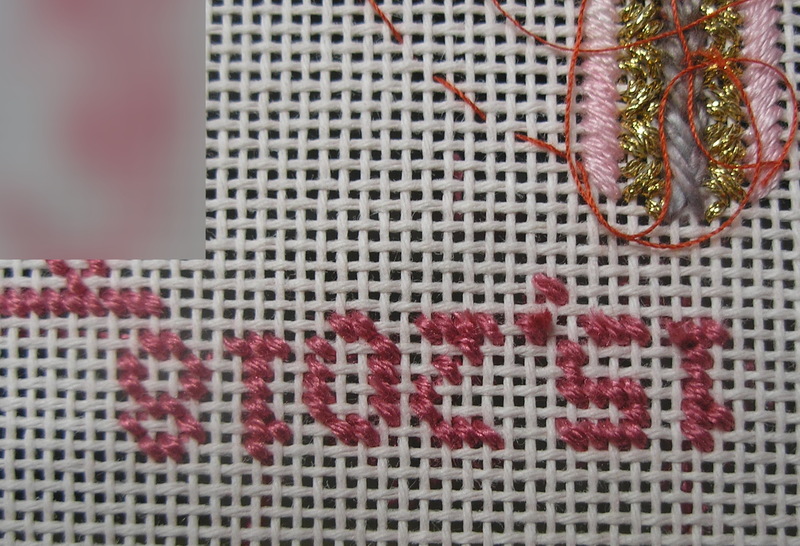 I use an alphabet that is 9 stitches high for uppercase and 5 stitches high for lowercase letters. 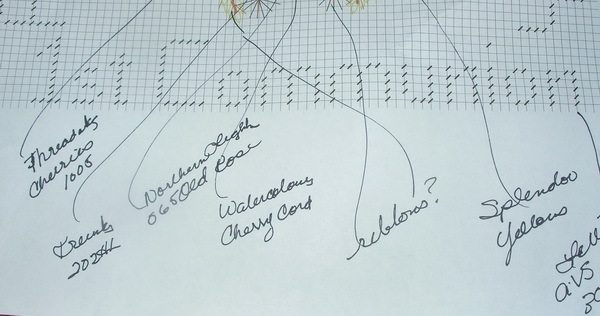 Whatever method of framing you decide to use, your design MUST be planned on graph paper. 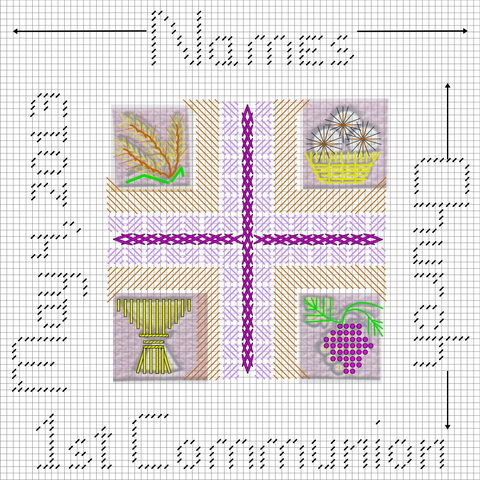 Plan your design out first on graph paper, remember to allow for open space around the design area I usually figure 5 threads on each side for this type of design….although you usually are going to get extra space by choosing a standard mat..
For example: a name like Christopher Robin is long…by my quick calculations this rectangle stitching would need minimum 87 by 105 threads. This translates to 87 divided by 18 count canvas equals 4.8333 inches of 5 inch opening and 105 threads divided by 18 count canvas equals 5.833333 opening or 6 inch opening , Since standard mats usually are 5 x 7 inch openings. I would be look for a shadow box frame with a precut mat with a 5×7 inch opening or find a frame I liked and have a 5 x 7 inch mat cut to fit the frame. 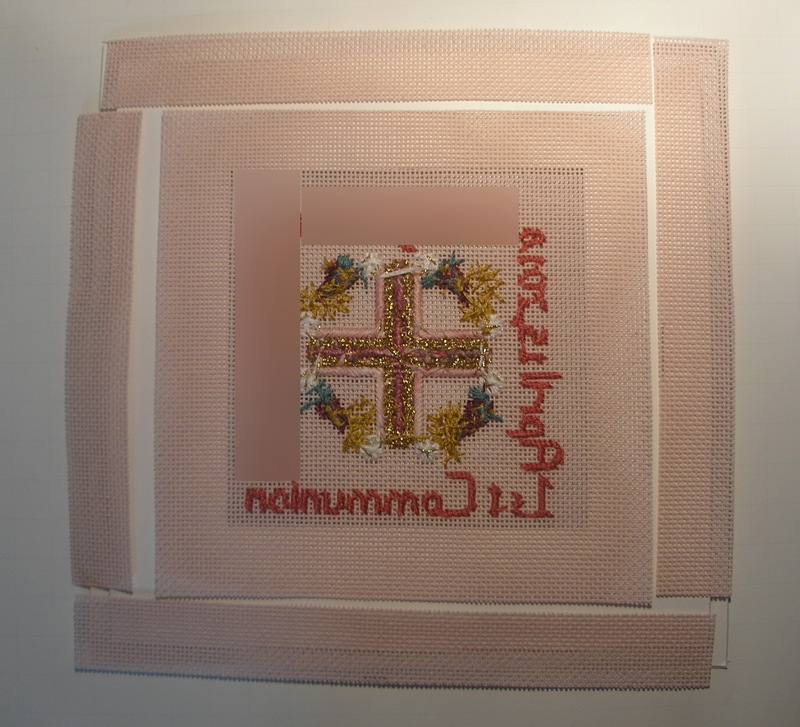 The best method is to have your piece stitched when you go to look for the frame. 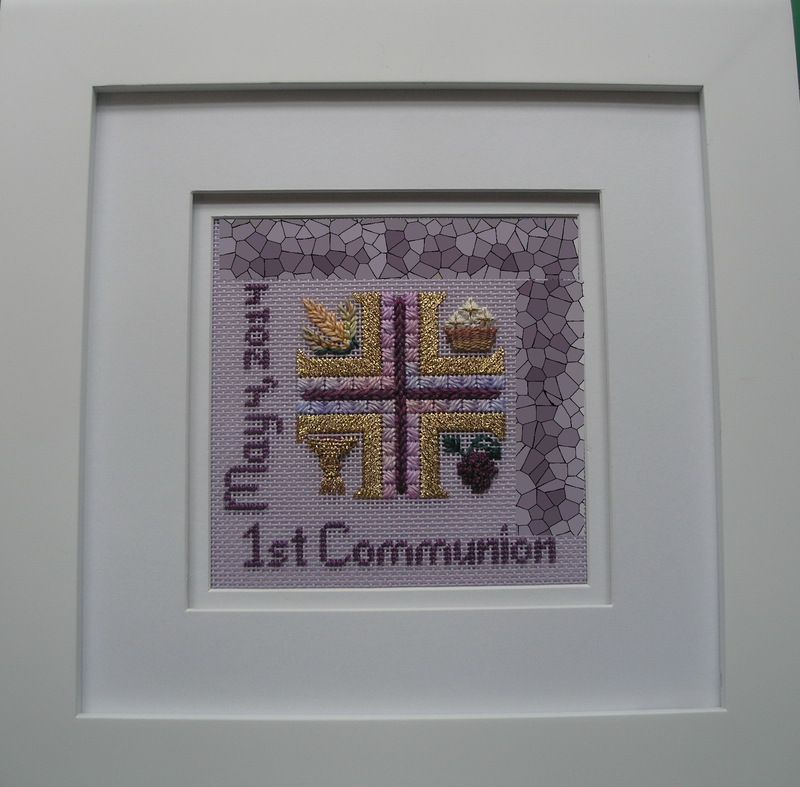 If you are lucky you will find a precut mat and frame; otherwise you may have to have a mat cut to fit a premade frame. But remember sometimes this still does not work and you are going to have to bite the bullet and the piece custom framed. 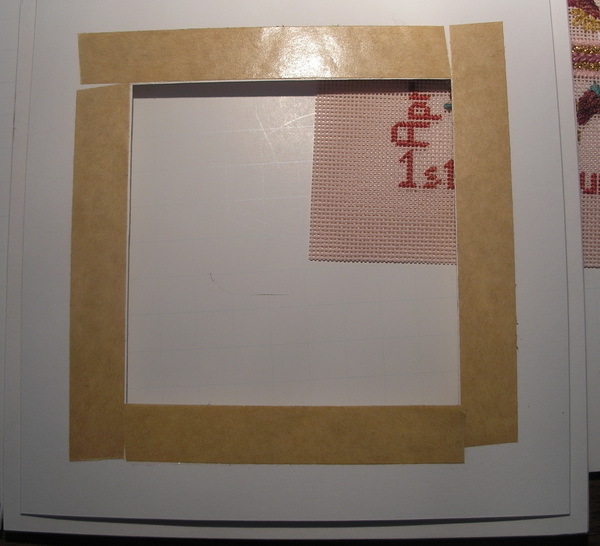 EDNOTE: If you are planning to enter a piece to be judged, then you MUST have the piece custom framed. 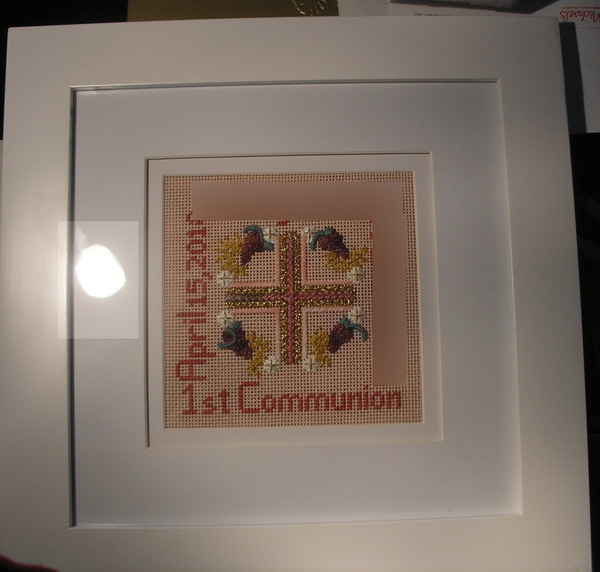 …There are framing rules too, maybe not rules but guidelines or ratios of mat size to frame size…Your framer will know these, I don’t; I just know if I like the way it looks matted and framed. I tent stitch the grape areas first. 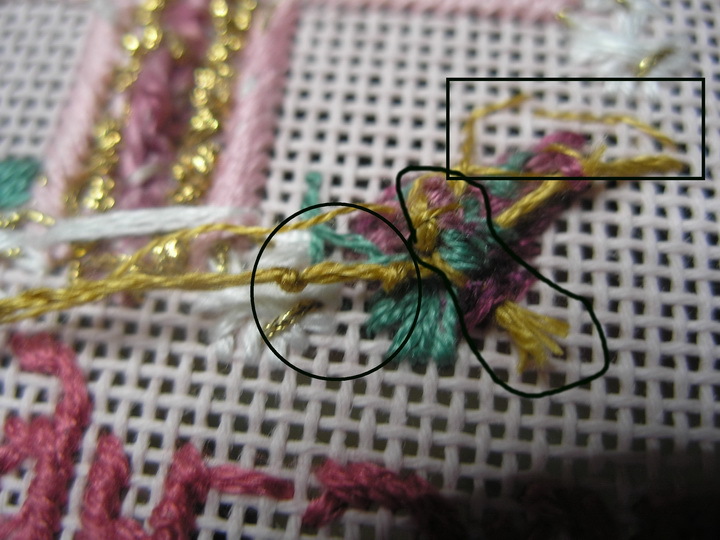 This gives me an idea how they will look and it is easier to remove tent stitches than it is French or Colonial knots. 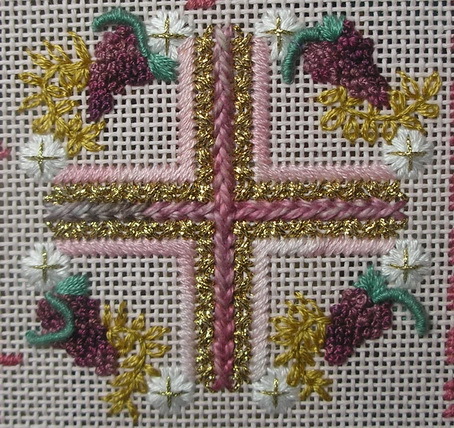 Then when I stitch the grapes if I am using an overdye I use the puddle stitch technique to stitch the knots. 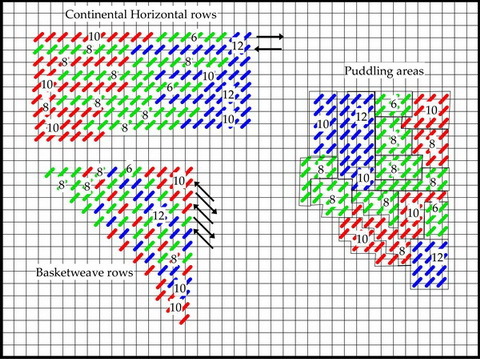 I learned this from John Waddle years ago and blogged about it once but I will repeat it since it was years ago that I wrote about puddle stitching. Here is a graphic of a length of an overdye thread; I have numbered each segment with an arbitrary number of stitiches (10-8-12-6-etc…). 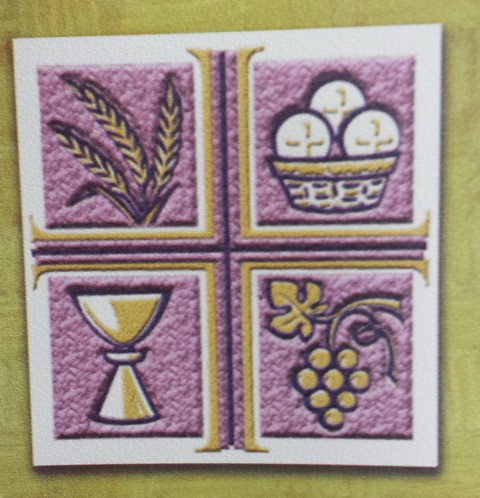 Notice that there are three circled 10’s; these are the beginning of the repeat. 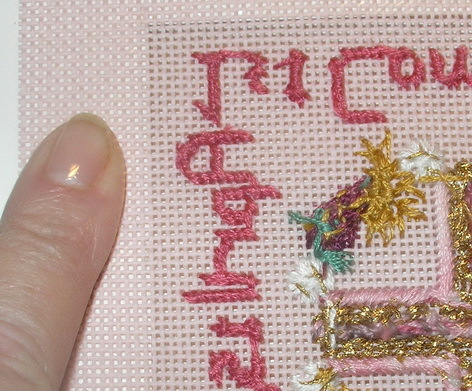 The numbering has no significance in puddle stitching other than to show the repeat and the number of stitches I arbitrarily assigned to each area. 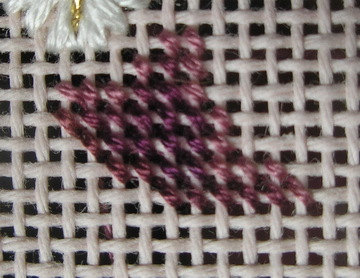 The next graphic shows this overdye thread stitched in Continental Horizontal rows (top left), Basketweave (bottom left) and then puddle stitching on the right. 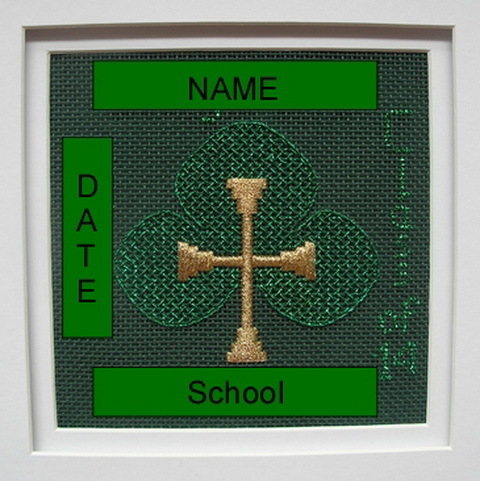 I attached the sequence numbering to all these so you could compare to the first graphic and follow he sequence of stitching. The puddle stitching is a bit hard to follow but you can and there is no method to this it is just a random thing. Puddle stitching is nothing but a group of stitches randomly placed together to form a puddle of color. 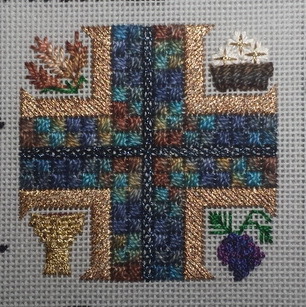 You could call this method a glob, blob, whatever you choose to call it…but then it would have to be glob stitching, blob stitching and I like puddle stitching best. Remember this is not my technique I learned it from John Waddell (http://johnwaddellneedlepoint.com/index.html) in his Fun with Overdye class. If this has confused you more I am sorry but just drop me note and I’ll see if I can do better or take a class from John, he’s really good or maybe your local shop can help you. 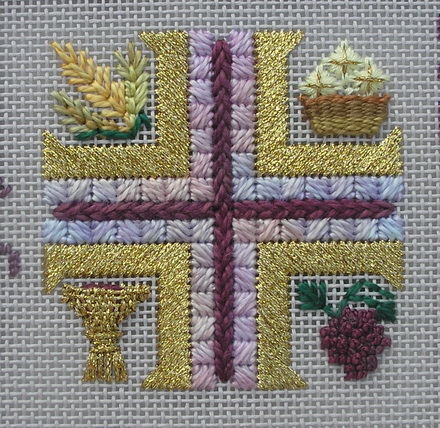 I sometimes make a tiny twist of usually 2 ply floss to be the stem of my flowers or in this case wheat. 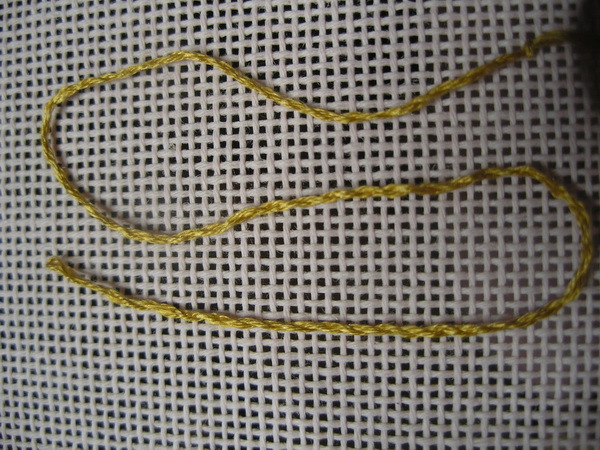 I showed how to make a twist here: (https://sudukc.wordpress.com/2014/09/04/all-twisted-up-making-cording/) and this twist is the same but it is only an 18 inch length of thread so I usually just twist between my fingers. 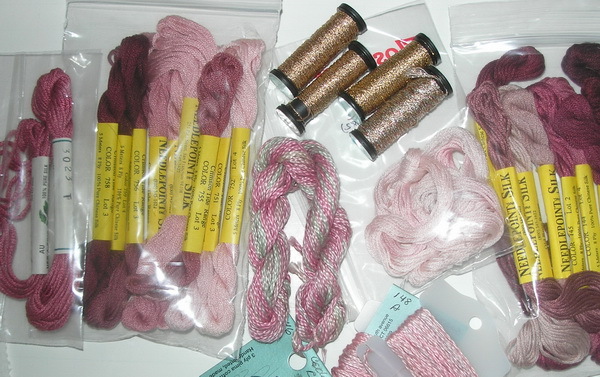 Once the twist is make I use a larger needle. 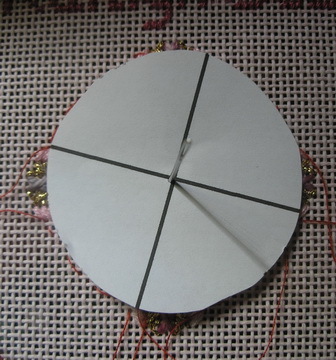 I thread the twist into this needle to start stitching. 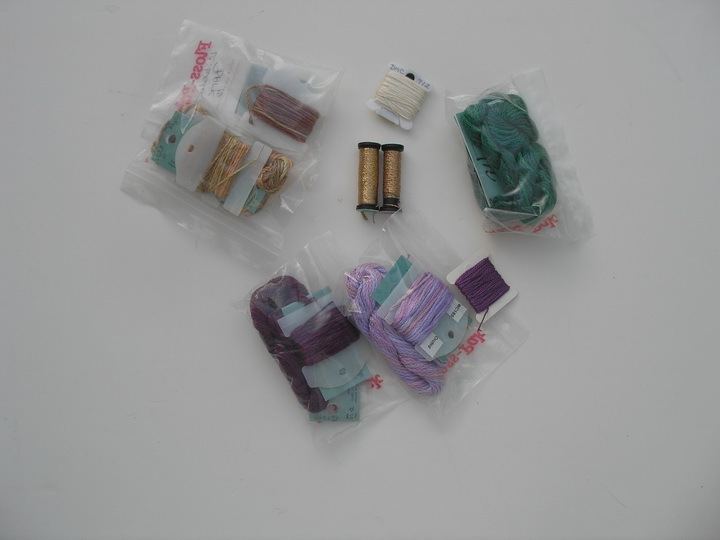 I bring the twist to the front of the canvas leaving the knot on the backside…I know the rule about knots and needlepoint but there are exceptions to every rule. I’m showing you the back of the my stitching because that’s where all the work can be seen! The free form shape in picture is my beginning knot. The rectangle is the line I couched the twist on the front with second needle using 1 ply floss. And the circle is a picture of how I end this twist. Ending the twist depends on if there is enough twist to use again. If there is enough twist to use again make two overhang knots as shown in picture and cut between them. 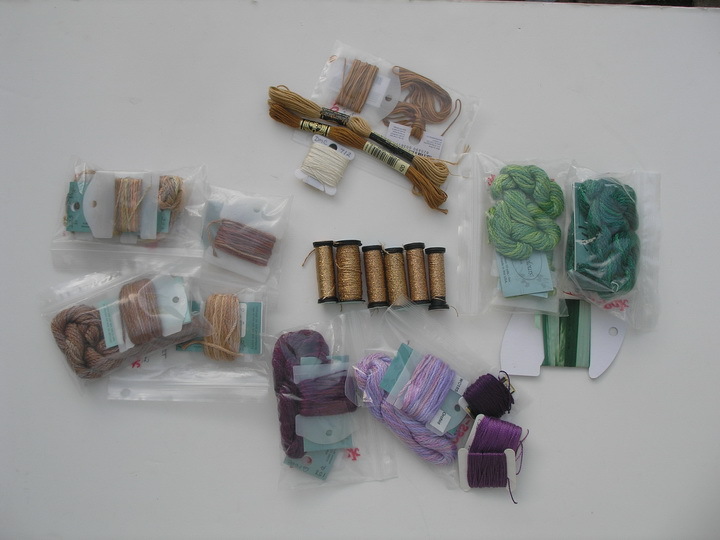 This will help keep the stitched twist from becoming lose and it also keeps the remaining twist, twisted. 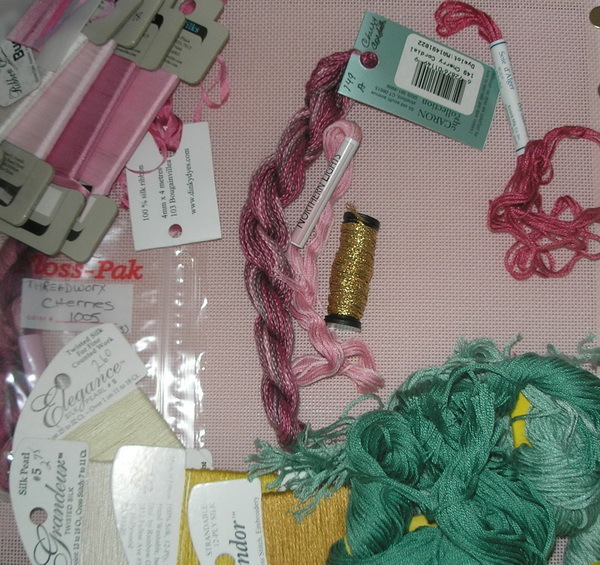 If there is not enough twist to use again just make an overhand knot and clip, leaving the knot on your canvas. 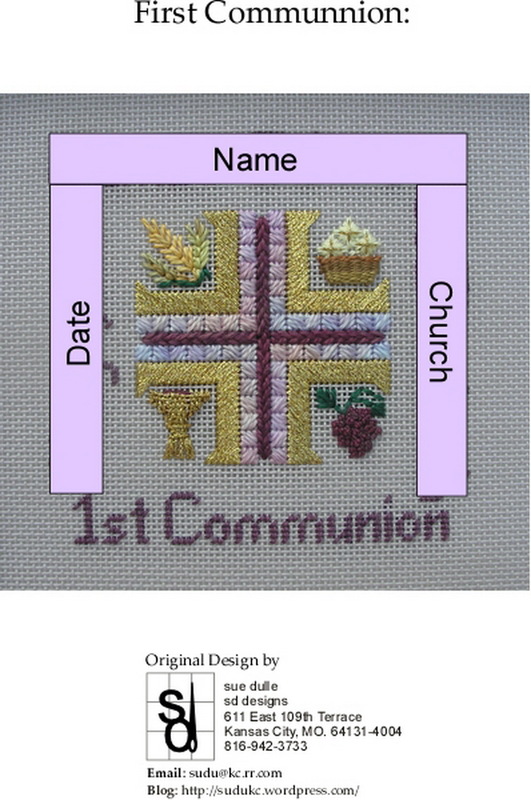 Over the years I have stitched three 1st Communnion Crosses and I have a PDF version of the first cross instructions but have also included information on all three in this newly revised edition. 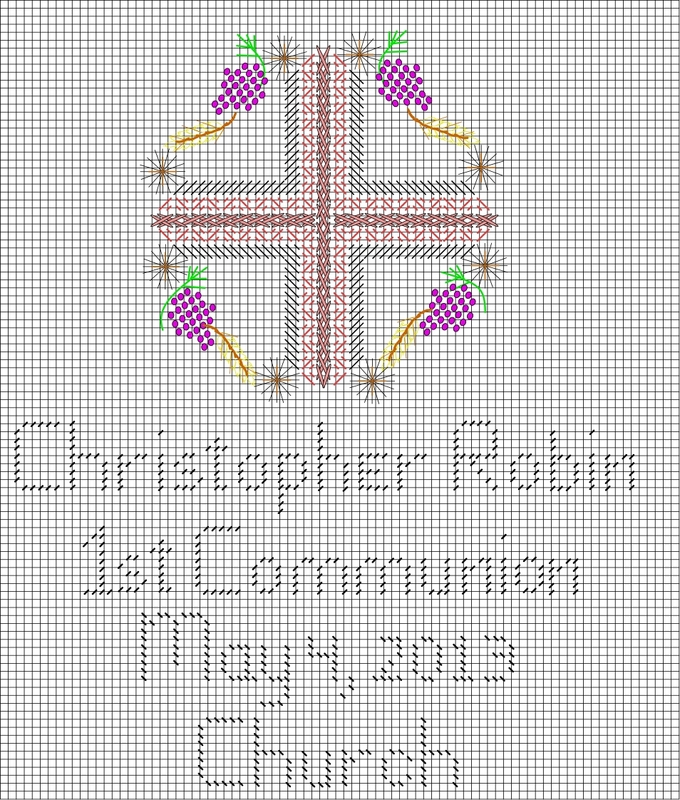 If you are interested, email me (sudu@kc.rr.com) your email and I will send to you a copy; be sure and put 1st communion in subject line or it might go to my junk mail.